With interest rates near record lows, many homeowners want to refinance their mortgages. This can make sense, since it can mean that you save money over the life of your loan, or that you can improve your monthly cash flow (or do both). One of the first things to consider is the purpose of your mortgage, beyond getting a lower interest rate. Is cash flow important to you? Or are you more interested in long-term savings? Look at your monthly income. Do you wish you had a little more wiggle room? If you are looking for money in your budget each month, refinancing can help, if you extend your term. A 30-year mortgage provides you with a lower monthly payment, allowing you the opportunity to breath a little easier – especially if you are worried that you might run into financial problems later. On the other hand, you might be interested in long-term savings. This means paying off your loan as quickly as possible, even if it means a higher monthly payment. A shorter term at a lower interest rate can mean a savings of tens of thousands of dollars over the life of your loan. If you have the room in your budget, this can make sense. But if you will be stressed to make your payment each month, this might not be practical. When you refinance (or get any loan for that matter), getting the best possible interest rate is important. Before you apply for your refinance, check your credit to see if you need to improve your situation. If your credit score could use improvement, take a few months to fix problems. Dispute errors on your report so that the mistakes are remedied. Make your payments on time. Pay down debt. Avoid opening new lines of credit. If you do these things, you will be able to improve your rate. You might also be able to pay points on your refinance to bring down the interest rate a little bit more. Don’t forget to consider closing costs. If you can’t get a rate at least 1% lower than your current rate, it might not be worth it to refinance, since the closing costs might not be offset by your savings. 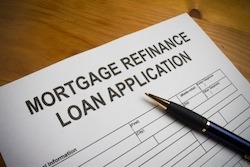 Don’t forget to consider the documentation that you will need to refinance. You normally need to show that you can afford your new payments (especially if they are higher), and that you have the assets available to pay closing costs and other out of pocket expenses. When I refinanced my mortgage earlier this year, I was required to pay off a small second mortgage that I got when I bought the house. This was an out of pocket expense that was considered in my refinance. I had to provide account information from my taxable investment account and my retirement account, as well as bank account information and PayPal income information. Find out what is required ahead of time so that you can avoid unnecessary delays. Also, be aware of the timing involved in canceling your autopay with your old mortgage lender. Talk to your new lender about the timing, and try to coordinate so that you don’t end up missing payments. My new lender, Quicken Loans, was great about helping me properly cancel my autopay at the right time so that I was up to date on my payments before they paid off the mortgage. Remember that your refinance is a mortgage loan. You basically get a whole new mortgage to pay off the old mortgage. As a result, you need to be prepared to go through all of the steps associated with getting a mortgage. Prepare ahead of time so that you know how your refinance will fit into your long term financial plan, and so that you know what you need to make the transaction successful.